This is a guest contribution from Bibekananda Basu, a retired General Manager from Reliance Industries Ltd. and Ex Faculty from Degree Engineering College at Maharashtra. Like all other Industries, textile Industries are also on a growing spree to meet the necessities of human beings by supplying the cloth for day to day needs, for decorative purposes and in the world of fashion. It is also the second highest employer in India after Agriculture segments. In these industries it is very much necessary to improve the working atmosphere looking at present socio economic structure of the society. This Industry, although a highest employer, does not attract much people to serve because of its unhealthy working atmosphere in most of the factories especially in decentralised sectors which is till at dominating stage. The Organised sectors, by and large follow the safety rules, ISO Norms for safety & Hazardous (ISO 9001:14001 & ISO 9001: 18001) till it does not attract the youths to take the job at priority basis. There are certain constrains in technical and administration areas which are yet to overcome. There are four major safety & hazardous issues pertaining to these industries. This article highlights the working conditions at each segment with solutions from Blow Room to Weaving Stage. In these sectors, Chemical exposures are absent hence that subject is not discussed in this article. 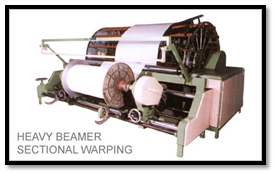 This Industry has got highest numbers of functionaries houses right from Blow Room to Carding, Spinning, Winding, Warping, Sizing, Weaving , Grey Checking, (*Desizing, Bleaching & scouring, Dyeing, Finishing etc. known as wet Processing Zone where Chemicals are used). In every house there is one or another, low or high hazardous aspect persists. Apart from these, there are Polyester Manufacturing units, garment manufacturing units who also create hazards in different circumstances depending on their manufacturing area. There are organised and decentralised sectors and certain matters are common i.e. Noise, water, air pollution. I have discussed the most hazardous and focused areas where the people are mainly affected. 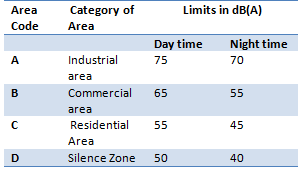 The prescribed noise level as decided by Pollution control board has given at Table-1. 1. Day time is reckoned from 6 A.M. To 10 P.M. Noise can cause hearing impairment, hypertension, ischemic heart disease, annoyance and sleep disturbance. Changes in the immune system and birth defects have been attributed to noise exposure. Noise exposure has also been known to induce tinnitus, hypertension, vasoconstriction and other cardiovascular impacts. Beyond these effects, elevated noise levels can create stress, increase workplace accident rates, and stimulate aggression and other anti-social behaviours. The most significant causes are prolonged exposure to loud music and industrial noise. 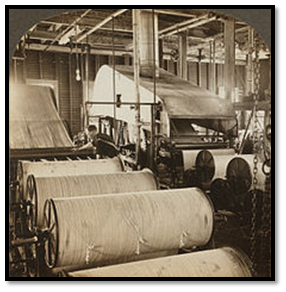 Although inhaling cotton dust was identified as a source of respiratory disease more than 300 years ago, byssinosis has been recognized as an occupational hazard for textile workers for less than 50 years. More than 800,000 workers in the cotton, flax, and rope-making industries are exposed in the workplace to airborne particles that can cause byssinosis. 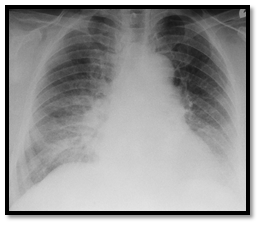 Byssinosis is a chronic, asthma-like narrowing of the airways. In the United States, byssinosis is almost completely limited to workers who handle unprocessed cotton. More than 35,000 textile workers have been disabled by byssinosis and 183 died between 1979 and 1992. Most of the people whose deaths were due to byssinosis lived in the textile-producing regions of North and South Carolina. The figure below is a typical example of byssinosis. Diagnosis: Tests that detect decreasing lung capacity during the workday are used to diagnose byssinosis. Obstructive patterns are likely in patients who have had recurrent symptoms for more than 10 years. Treatment: Therapy for early-stage byssinosis focuses on reversing airway narrowing. Antihistamines may be prescribed to reduce tightness in the chest. Bronchodilators (drugs used to relax breathing passages and improve air flow) may be used with an inhaler or taken in tablet form. Reducing exposure is essential. Any worker who has symptoms of byssinosis or who has trouble breathing should transfer to a less-contaminated area. Wheeze: A whistling sound made by the flow of high-velocity air through narrowed airways. Wheezing is a symptom of several respiratory diseases including byssinosis and asthma. 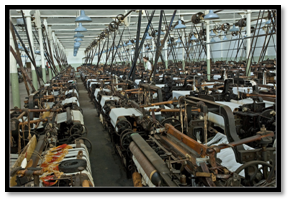 Prognosis: Smoking, impaired lung function, and a history of respiratory allergy increase a textile worker's risk of developing byssinosis. Prolonged exposure makes patients wheeze more often and can cause chronic bronchitis. It does not lead to permanently disabling lung disease. Prevention: Exposure to textile dust is the surest way to prevent byssinosis. Using exhaust hoods, improving ventilation, and employing wetting procedures are very successful methods of controlling dust levels to prevent byssinosis. Protective equipment required during certain procedures also prevents exposure to levels of contamination that exceed the current United States standard for cotton dust exposure. In this area, the main function is to split the cotton fibres in to individual and then to form sliver. At these functionaries areas the workers are exposed to particles of pesticides and soil. Exposure to cotton dust and other particles leads to respiratory disorders among the textile workers. The fatal disease of byssinosis, commonly known as brown lung, is caused among people working in the textile industry on account of excessive exposure to cotton dust. The symptoms of this disease include tightening of the chest, coughing, wheezing and shortness of breath. Hence the Occupational Safety and Health Administration i.e. OSHA made it compulsory for employers in the textile industry to protect their workers from over exposure to cotton dust and its evil effects. The OSHA determined certain guidelines which are applicable to all private employers in the US textile industry. For an eight-hour day, the OSHA Cotton standard has been determined at 500 micrograms of cotton dust per cubic meter of air. Employers are required to measure the quantity of respirable cotton dust once in 6 months or whenever there is any change that might lead to a change in the level of dust. If the level of dust in the atmosphere is higher than that as per OSHA guidelines, the management should take measures to reduce the same. A study conducted by R. Steinberg, J. Hannak and K. Balakrishnan regarding textile units in India revealed that pulmonary function in textile workers decreased significantly with exposure to cotton dust over a long period of time. Another study conducted on textile units in Mumbai, India indicated an 11-33% incidence of chronic bronchitis.Lesser the cotton staple, higher are the risks. However the noise level at Blow room to Card is within permissible limit. Precautions: Proper humidification inside the Hall , Functioning of all the exhaust fans, proper housekeeping and cleaning, prevention of flying of cotton dusts in open air, use of mask by the operators, proper maintenance of the machines will help in maintaining the dust level. This is the final step of manufacturing a cotton yarn. The figure has shown below. 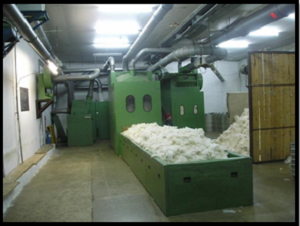 In this functional area the OHSA standard for cotton is 200 microgram per cubic meter. The noise level for the spindle speed of 20000 and that of 1, 10,000 rpm of rotor is 70 to 100 dB. The dust pollution generation depends on staple length (shorter the length , higher the dust generation) , twist per mtr, improper humidification, climatic condition, higher breakage rate, bad machine condition, improper air circulation and exhaust fan functioning etc. The noise is mainly depends on spindle speed, poor mc condition, hall design, machine installation etc. Prevention : Although total prevention is not possible, but both hazardous areas ( noise & dust generation) can be prevented by proper humidification, M/c Maintenance, putting exhaust fans, proper house keeping, putting mask and ear plugs. Another hazardous parameter in Blow Room to Ring frames are high temperature. It creates due to location where the factory is situated, season, machine condition, m/c allocation, type of machine etc. To some extent it can be minimised with proper humidification, floor space and m/c allocation, ceiling heights and by improving its surroundings i.e.by putting Trees around the compound walls. In order to minimize the risk of industrial diseases among the workers, Occupational Safety and Health Authority (OSHA) of U.S.A has specified concentration limits of dust in the air streams of production rooms for compliance by the concerned industries is given. The table 3 is OSHA standard to follow, but in reality, it crosses the higher limits depending on situations. After Ring frame, the functional area of weaving preparatory starts. In Winding department, the noise level is, in general 70-85 dB depending of types of machines. In warping section, the noise level is within permissible limit and hence, as such no data is available. But in both the sections, dust generations are on higher side which are 200 microgram per cubic mtr. The dust generations again depends on type of fibre (say shorter the length, higher is the dust), type of machine (friction drive generates more fibre than direct drive), humidification, mc maintenance, Hall design etc. Prevention is common for all i.e. proper humidification, mc maintenance, putting mask inside the department. Heat generation especially at day time of summer sometimes goes as high as 50 degree and plus. In decentralised sectors, at some places, the Warping machines are kept very near to ceiling and that too of asbestos roof. One can think of such heat where the warpers work for 10- 12 hours in a day. Dust generates mainly from Creel zone and that too depending on type of yarn. The figure has given at table -3. Prevention from heat: Proper exhaust of steams by ducting system, Air circulation, machine maintenance etc. Regular precautions and housekeeping will prevent slippery floors. It is the final stage where the fabrics are being manufactured on machines. Among all, this is the highest Noise polluting zone. Please refer table -2. 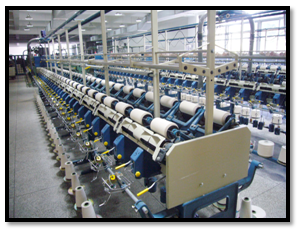 The modern machines are coming in the market with high sophistication to produce quality Fabrics, high production rate, varieties of cloth, but no one is able to produce machine with permissible noise level. The main area of noise generation in loom is picking. The shuttle less looms although generate less noise, but not at low frequency. 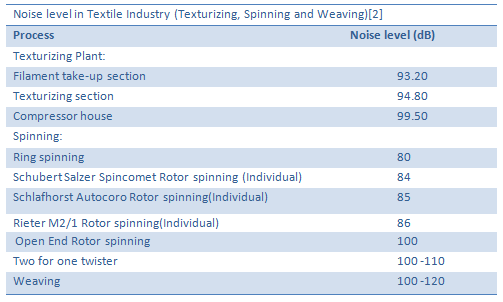 The pictures of various looms are shown here where noise level crossed 100 to 120 dB. 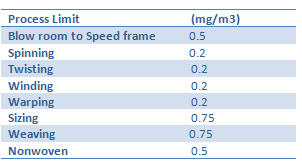 As per table no 3, the dust generation is 750 microgram per cubic mtr. The dust generations again depend on type of fibre; say cotton, blended, polyester etc. The Polyester fibres generate lesser dust. Prevention from Dust: It is like previous chapters’ i.e. proper humidification, machine maintenance, better yarn preparation etc. Noise can be minimised to some extent with proper maintenance, Hall area planning and putting ear plug to the weavers. Dust generations, noise pollution, and heat generation are really chronic problems for the Textile Mills workers. Managements must be taken cares in all those aspects as suggested at each step of function. Workers are to be supplied with mask, ear plug etc. Regular health check up and treatment should be done. OSHA Norms should be followed. Mr. Bibekananda Basu has 42 years of working experience in Textile Industry in R&D, Production, Q.C. Marketing, and Management etc. He is a retired General Manager from RIL, ex faculty from Degree Engineering College at Maharashtra, and ex co coordinator Sasmira. He is an expert in Textile management and Texturisation. He has authored 25 published papers in International level.